This is not an April fools joke. I’m really trying to get you to make chicken taco soup today! I know! It’s April 1st and here I am, about to ramble on about SOUP. Soup of all things, at the beginning of Spring. I swear there is a good reason for it. Don’t run! First, April tends to be super rainy, so there is always that need for comfort food. And second, as a serious soup lover, sometimes I want soup for lunch and dinner, even if it’s 75 degrees out. You know? I like to break all the rules. Or not even follow them in the first place. Years ago (and we are talking yearssss), I shared an easy chicken tortilla soup. It’s a really darn good soup for how quickly it comes together. It’s one I make frequently, but I make it a little differently these days. Back then, I didn’t make my own enchilada sauce. Now I do, so I use that if I make the soup. I also add in a few more spices. I’ve never gone back and edited the recipe because so many of you still make it today. Another recipe I love is this smoky white bean chicken chili. 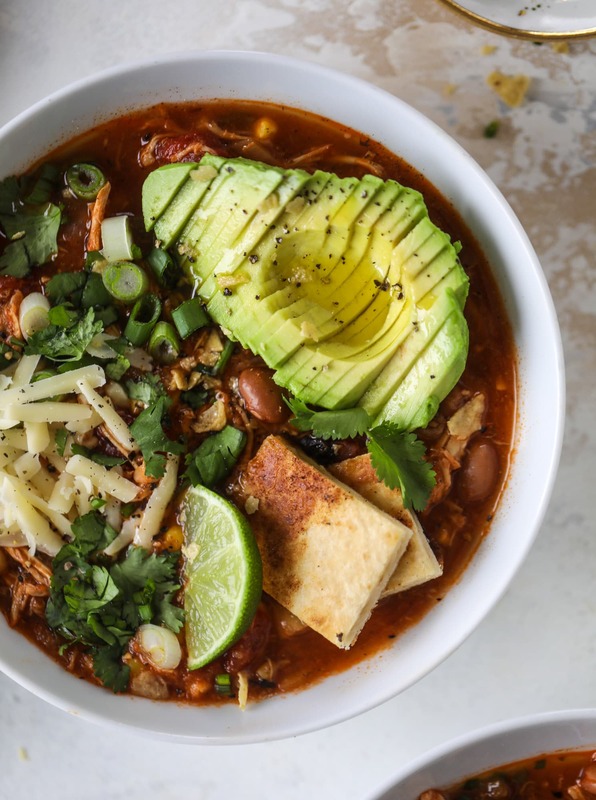 This chicken taco soup is my hybrid – a mix of that chili and the tortilla soup! This version is so, so simple too. Per usual, you can use leftover shredded chicken here or a rotisserie chicken if you like. You can also make chicken (I would probably roast it) and shred it just for this recipe. Whatever you need to do! It’s very satisfying. Some of my other favorites that I added in: two cans of diced green chiles, pinto beans (all-time favorite bean, right here), fire roasted tomatoes (because apparently I can’t do anything tomato-y without them) and corn too. I never add corn at the end of my soups and I don’t know why. Because it’s so good! Tortilla chips, cilantro, green onions, shredded cheese, avocado… and my favorite part? Yes, that is what takes this soup to dinner-level for me. I made a few cheese quesadillas and cut them into squares, almost like cheese quesadilla croutons. This cheese quesadilla salad has always been one I’ve loved, and I knew that quesadillas on soup? Would work brilliantly. It’s almost like floating a baguette on the top – except that baguette is crispy, toasted tortillas that envelope melty cheese. Could not love it enough. However, this is also a great make-ahead dish that you can prep for your lunches for the week. If you’re not a soup person, scoop out your serving with a slotted spoon and place it over top of tortilla chips to create nachos or a baked potato for more satiety. You definitely don’t need a slow cooker here either. It comes together in less than 30 minutes, so you can easily make it on the stove top if you wish. I give you all the details in the recipe below! Now give me all the dipping chips. This flavorful chicken taco soup can be made on the stovetop or in the slow cooker. It's hearty and topped with cheese quesadilla croutons! Heat a large pot over medium-low heat and add the olive oil. Stir in the onion, garlic, salt and pepper. Cook, stirring often, until the onions are softened, about 5 minutes. Stir in the chili powder, cumin and paprika. Stir in the tomato paste and cook for 2 minutes. Add in the chicken, green chiles, fire roasted tomatoes, tomato sauce and chicken stock. Add in the beans. Stir well. Bring the mixture to a boil, then reduce it to a simmer and cover. Simmer for 20 minutes. Uncover and add the corn. Cook for 10 to 15 more minutes. Squeeze in the juice of 1 lime. Serve immediately with the cheese quesadillas on top and lots of your favorite garnishes. If you’re making this in the slow cooker, add everything but the corn to the slow cooker and cook on low. You can cook this up to 6 to 8 hours – or it will taste great after 2 hours! About 15 minutes before serving, I stir in the frozen corn. Heat a skillet over medium heat and add the butter. Place one tortilla on a cutting board and add spread the cheese evenly over top. Place the other tortilla on top. Gently transfer the quesadilla to the skillet. Cook on both sides until golden and crispy, about 3 minutes per side. Transfer the quesadilla back to the cutting board. Let it cool for 5 minutes so the cheese can set slightly. Slice the quesadilla into pieces (I like to do squares) and serve immediately with the soup! Def going to top all my soups with quesadillas now. haha i love that so much! made my night! Love this! I live in Chicago, so we definitely still have some time before true warm weather rolls around. Can’t wait to try this, pinned!